In honour of I Love Yarn Day, let's hear it for Noro! What's not to love about amazing colour shifts in yarns that include wool, mohair, silk, and all sort of other goodies? The problem is loving it too much to leave the store with just one skein, and then not knowing what to do with it. And for Noro's bulky Odori yarn at least, here is the solution: the Spin Cycle Hat. 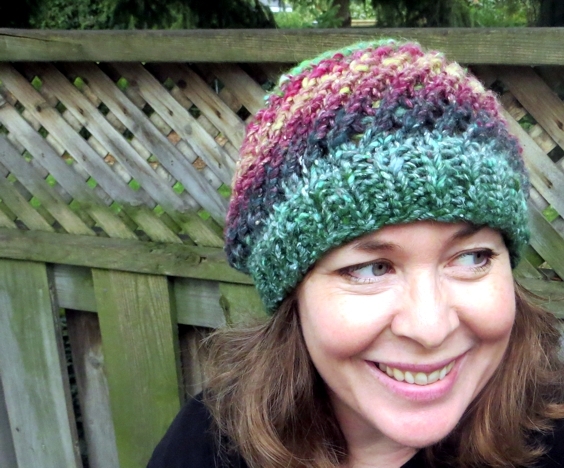 I have to say, I am feeling pretty crazy about this hat. I was aiming for some positive ease, which I got because Odori has silk in it (remember how silk stretches, from my post on yarn substitution? ), and it's just warm as I thought it would be in spite of all those holes, because the bulky yarn is so very, very bulky. The holes and that extra ease just kind of trap heat. I'm sitting in front of an open window with it on as I type this, and even though my nose is cold, the rest of my head is toasty. And go you - find some bulky yarn in your stash, and transform it into somebody's present, heh. 6 mm/US 10 - 1 set double pointed needles or size to obtain gauge. S (M, L): S (17.75", 20", 22.25") circumference; 7.75"(8", 8.25") high. Shown in M, worn very comfortably over a 22" head. 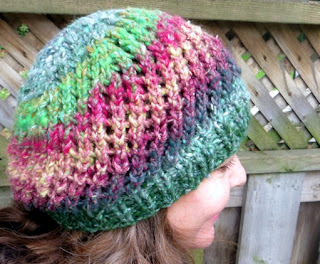 Moderately Easy: advanced stitches include K2tog, yo, and Kfb (knit into the front and back of a stitch. Worked in the round. 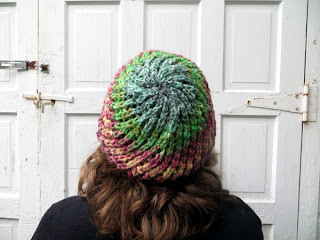 I love the Spin Cycle Hat, but I would like to know if we can use a different yarn because the Noro, Odori is very expensive. Keep me posted on your progress Auntie Stina - that would be cool to know how to do! I knitted this hat and it is beautiful. Do you have a pattern for a Cossack or Russian hat. I would like to knit one for my husband. Can you use circular needles instead of the double point? Thanks for the free pattern, cute hat. I'm making 2 of these embroidered with Mr and Mrs respectively for two adorable people getting married soon! 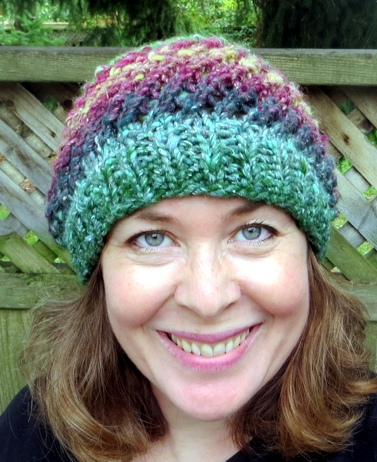 Hi Tamara and welcome to the wonderful world of knitting! I'm not sure if this is the source of your problem but [yo, K2tog] 5 times, K1 is a multiple of 11. You really count from the stitches that exist just before you start - so the yarn over, where you are adding a stitch, doesn't count. That leaves you with the two stitches you knit together - again, after the stitch is done you'll have one, but just before you start it's two stitches. So: two stitches, five times = 10, plus your K1, = 11 stitches; from 66 stitches you're dividing your crown into 6 segments. I wonder whether it would help you to place markers at the end of each of these sections so it's easier to catch where you have any mistakes, by counting the stitches in each section before going on to the next round? All the best and keep me posted! Thank you for the quick reply! I think I know what I did wrong... In interpreted 'yo' to mean bring the yarn to the front *and then knit a stitch* - but it just means to bring the yarn to the front, period. So my had has extra knit stitches after all the yarn overs. :-) I'm just going to continue in that pattern for the decreases and make the next one the right way. Tamara, if you do a yarn over and knit a stitch you're actually increasing every time back to the number you started the round with... so you will have a very long hat with no crown at all! But you could just cast off when you feel it's long enough plus perhaps four inches, and run a cord through all the eyelets to tie tight.